My blog has been feeling very neglected after my move to the US and I thought with the recent release of Visual Studio 2010 / .Net Framework 4.0 Beta 1 it would be a good time to get back into a regular blogging rhythm. So for the first post I thought I’d run through a simple demo of the new N-Tier focused APIs in the ADO.Net Entity Framework bits (EF4) that are included in Beta 1 of Visual Studio 2010 / .Net Framework 4.0. For this demo we are going to build a simple WCF service that allows distributed clients to persist changes to a simple object graph with an Order as it’s root. The general approach I’m going to demo is for people who want to have complete control over their entities and don’t want to share behaviour between the server and distributed clients. On the other hand if you are after something that “just works out of the box” then you should check out Self Tracking Entities. There is still one piece of the EF4 N-Tier story to come in the next stage of the release cycle, the availability of a new “Foreign Key Association” type. Apart from the obvious use cases for exposing FKs this new type of association also has some great side effects for processing changes on the server in an N-Tier scenario even when you don’t want to expose actual FK properties to the client. I’ll touch on this more during the post. Remove Customer.Orders and Product.OrderLines navigation properties, in Beta 1 there is no way to do this in the designer so you need to open the edmx file in a text/xml editor and remove the navigation properties from the CSDL section. I can also combine the above two points and modify the default T4 template to only generate the derived context and then write my own classes for the entities. I’ve included this T4 template as seperate download at the end of the post. For my change tracking approach all my classes derive from my custom class StatefulObject which has a State property that gets set to “Unchanged” as it leaves the server, I’ve also included a helper method to convert this state to the equivavlent state used by EF when we play back changes on the server. Now for change tracking, basically this is the “insert preferred method” section, I’ll just re-iterate if you don’t want to worry about how change tracking is done then this isn’t the article for you… you want to wait for Self Tracking Entities. My entities all derive from a base class that has a state property on it which can be Added, Unchanged or Modified (again this is just how I’m choosing to do things, there are plenty of other approaches). The client is responsible for setting this property to the appropriate value. As already mentioned I’m not sharing any classes between tiers so the client is just going to get the standard proxy classes that get generated for service references. I’m just implementing two methods in the service, one to do the actual persistence of and order and another that will fetch the details of an order, this second method is just to help us out with some end to end tests at the end. There is “not-so-pretty” bit of code there to deal with the possibility that the Customer that the order belongs to has changed, that block of code will go away once we have “Foreign Key Associations” available (coming after Beta 1). I’ll also add that using this new association type does not mean we have to expose FK properties to clients to get this bennefit. This API was around in EF v1 and is by far the easiest way of getting things back into the context, mainly because it is the most relaxed API and doesn’t require unique keys etc. From here it is really easy to shuffle things around into the correct state. The name is a little misleading as it will in fact add an object and also any other entities that are reachable by traversing navigation properties. Not much to say here, basically it just moves the entity into the specified state. Depending on the target state it may have an impact on the surrounding relationships (i.e. moving an Object to the Added state will also move any Unchanged relationships to the Added state). Marking an entity as Modified will mark all scalar values as modified. This will change the existing relationship between two entities to the specified state or if there isn’t a relationship it will create a new one in the specified state. This is handy because changing a relationship (i.e. 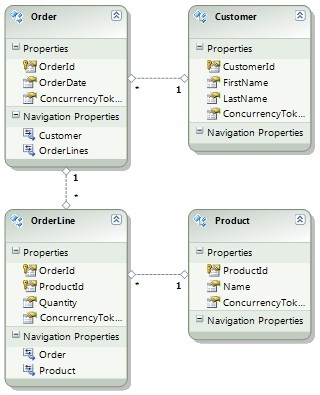 moving order to a different customer) requires an Added relationship to the new parent and a deleted relationship to the original parent. If we already have the new relationship created we can paint in the original relationship. I’ll add that this requirement goes away if you swap to using Foreign Key Associations which will be available in the next instalment of the VS2010 release cycle, this makes life a lot easier and I look forward to blogging on that at a later date. This API-behaves the same as ChangeObjectState or ChangeRelationshipState depending on whether the ObjectStateEntry in question is for an object or relationship. This API existed as ApplyPropertyChanges in EF v1 and basically takes the scalar values from the supplied object and copies them into the object with the same key. Any values that differ from the original values will be marked as modified. The problem with ApplyCurrentValues is that in N-Tier scenarios we usually want to attach the current entity (which has relationships setup with all the other current entities) and then have a way to express what the original values were. So now we have ApplyOriginalValues which work the same as ApplyCurrentValues but updates the original values.